Cleveland Clinic's main camps. Photo courtesy of hospital. Bernie Moreno Companies has launched a new fundraising campaign named “Keys for Kids”, that’s aimed at supporting children’s initiatives at three large hospital systems inside Northeast Ohio. The dealership group recently announced that its newly launched campaign will run into next year and benefit Cleveland Clinic, as well as MetroHealth and University Hospitals of Cleveland. Throughout the year, the Keys for Kids program will receive a portion of proceeds from each vehicle purchased at Bernie Moreno Companies’ Mercedes-Benz of North Olmsted, Porsche of North Olmsted and Cleveland Motorsports locations. 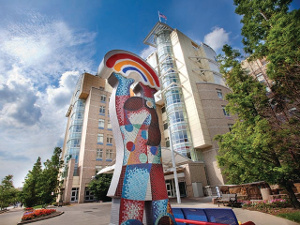 While donations made in June, July and August will go to help fund MetroHealth’s School Health Program, this September into 2019, Bernie Moreno Companies explained that second and third rounds of donations will benefit Cleveland Clinic’s Children’s Hospital and University Hospitals Rainbow Babies & Children's Hospital in Cleveland. “Whether it’s a second-grader getting an annual check-up during her school day because of Metro, a 5-year-old boy getting groundbreaking cancer care at the clinic or a preemie thriving at Rainbow, our community’s children deserve the gift of the best healthcare possible,” Bernie Moreno Companies president Bernie Moreno explained in a news release. MetroHealth’s School Health Program provides health care to students who attend 13 Cleveland public schools, according to the company. University Hospitals Rainbow Babies & Children's Hospital. Photo courtesy of company.